AMNEVILLE, France (CelebrityAccess MediaWire) — The third annual installment of the Sonisphere Festival France has concluded after a successful weekend, despite reporting the death of one attendee. 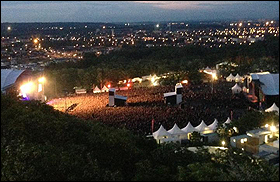 More than 55,000 metal fans turned out for the Sonisphere Festival, which took place on June 8 & 8 in Amneville, France. The lineup for the event included Iron Maiden, Korn, Slayer, Megadeth , Children of Bodom , Amon Amarth , Motorhead , Mastodon or Airbourne.